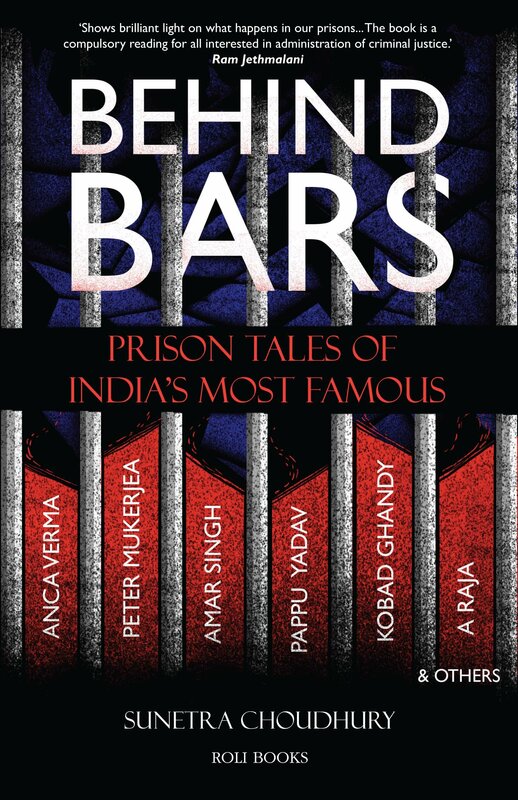 Behind Bars by Sunetra Choudhury is a compilation of case studies of prisoners with an underlying current of exposing the unfairness of life, which gets even further accentuated behind bars. She has tried her best to accommodate all kinds of players in her compilation: politicians, corporate honchos, rebels, commoners, et al. There are total of 13 case studies, which I have read all, but the names which have lingered on are Wahid, Amar Singh, Somnath Bharti, Peter Mukherjee, Pappu Yadav, Kobad Gandhi, A. Raja and JP. However, Amar Singh and Somnath Bharti are complete nuisance in the otherwise excellent compilation. If I were the editor, I would cull these two names and shorten the reading length to around 200 pages (or may be even shorter to just 100 pages by culling a few more names: Peter Mukherjee, the Teenager, the Foreign Model, et al). A. Raja is a celebrated case and has already been talked about a lot, but his presence is necessary to highlight the extent to which prison authorities can bend to accommodate a VIP prisoner. There were a few commoners too in the compilation like the Transgender, the Teenager, and the Muslim Bride, but their stories haven’t left a lasting impression on me. The only story of a commoner which struck strong like a storm wind is that of Wahid. Sushil Sharma, the Tandoor Murderer, who seems to have become a saint inside the prison, doesn’t have much to offer as far as the prison life is concerned. Of course, he has stayed the longest inside the prison including in solitary confinement, but his disposition is too religious to inspire trust. The Foreign Model, who seems to have lived a five-star existence inside the prison, is also forgettable because of her unique circumstances. Peter Mukherjee has also been written about a lot, and, of course, one can make a presumption that he is living comfortably enough inside the prison. So, the only stories which deserve amplified attention are Wahid, Kobad Gandhi, Pappu Yadav and JP. I would start with JP, the Mallu American. His case is important because it presents all aspects of prison life: he entered the prison like an ordinary prisoner, moved onto a higher category through sheer skill, received a setback, and moved up again. The manuevers required for a dignified existence in an atmosphere where basic amenities like toilet, food, sleep, etc, are unavailable but to a few are presented the best in this story. He had the wherewithal to buy the luxuries but somehow failed out of ignorance/stupidity/stinginess/misplaced ethics and suffered unnecessarily. The suffering presents a lesson to all that it’s best to carry your present status into the prison, which gets transported best through the money you possess; so, if you have it, use it. Pappu Yadav story is important because, as per his own admission, he is the pioneer of the VIP culture in prisons. He of course started like an ordinary prisoner, young at the age of 17. His parents dreamt of him as a US NRI, but his destiny took him to an uncommon career progression in tandem with his prison life extending for nearly quarter-century. So, indeed he is the connoisseur of all the delicacies of the prison canteens. When you have to live your life in and out of the prison, you hardly have any choice in the matters of love, but if you are a believer in “Love at First Sight” à la Pappu Yadav, well…you can even find love from inside the prison with your entrepreneurship skills. Pappu Yadav has himself written a book entitled Drohkaal Ka Pathik. I have a feeling it would be a primer on prison entrepreneurship, whose trailer is presented in Behind Bars. Kobad Gandhi is a struggle of a 70-year-old human body to survive in a hostile atmosphere, which is doing everything possible to deny it its existence. Fortunately, this 70-year-old body still had a flourishing mind bred in Doon, Xavier’s, and London, which petitioned and appealed incessantly for a dignified existence. The threat to the existence originated not only from the prison authorities but also from the inmates, who presented themselves the vilest in the form of the scary Bladebaazs. This story shows how the system conspires against the political prisoners, ironically, by depriving them of a status just that. At 70, you can hardly rebel. So, the grant of a status of that of a political prisoner in a prison in Andhra Pradesh, which claims to have eradicated prison corruption, is a reason enough to bring a smile and a cheer — indeed, Tihar was the worst. Wahid is the most difficult and the most unfortunate case. It is a case of an acquitted Islāmic “terrorist”, where the IB directly supervises terror through its informal police organs. Of course, the IB itself never comes into the picture and nor has the author given any hints of its complicity, but courtesy another author, i.e Mushrif in his book Who Killed Karkare, we pretty much know how things operate. However, what we don’t know are the gory details of torture techniques employed by police forces against the suspected ” terrorists”, which has been narrated vividly by Wahid to the author, and author has reflected it sincerely in the book. Another learning is the modus operandi of the co-conspirators, who range from doctors to judges. This is an existence beyond imagination. The yearning for dignity in the form of clean toilets, potable food, proper sleep, looks frivolous before the sufferings of a third degree torture at “180 degree”. I think this book is a must read for anybody and everybody, irrespective of their propensity to ever go to a prison even as a tourist because in the present atmosphere of mass surveillance, this is pretty much what life can become even outside the prison. Be the first to comment on "Review of Behind Bars by Sunetra Choudhury"